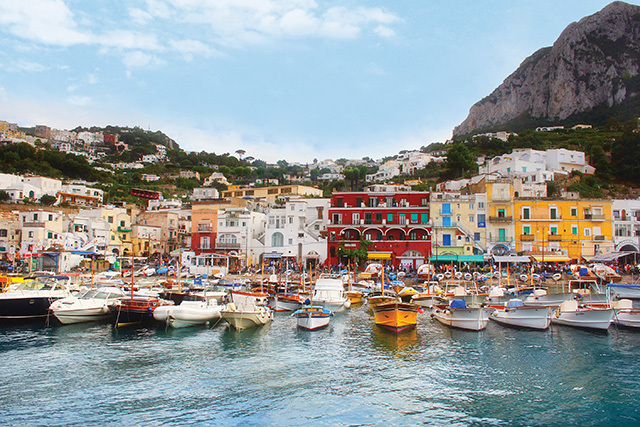 Known for its breathtaking scenery amid the crystal-blue Mediterranean and well-preserved ancient ruins, Capri has been attracting visitors from near and far for some two thousand years. Here, a few can’t-miss highlights on a trip to Capri. Villa Jovis was built by Tiberius, adopted son of Caesar Augustus and the second Roman emperor (A.D. 14-37). He built numerous villas on Capri, where he ruled the Roman Empire from A.D. 27 until his death in A.D. 37. The Villa Jovis is one of Capri’s best-preserved ancient sites and still includes the numerous baths, gardens and living quarters in which Tiberius once reveled. Most interestingly, you can still ascend the stairway behind the villa to a cliff-top promontory, where it is rumored that Tiberius’ soldiers would bring subjects who had fallen out-of-favor and give them a push. Tiberius’ bad behavior on the island is well documented, thanks to Suetonius’s The Lives of the Twelve Caesars. Suetonius may be one of the most accessible of the ancient writers. His works translate easily into English and make for fun, fascinating—and, in the case of Tiberius, scandalous—reading ahead of any trip to Capri (or Rome for that matter). In one famous anecdote about Tiberius’ rule on Capri, the emperor was approached by a fisherman while strolling alone and has the fisherman seized and beaten with the fish he has offered as punishment for approaching him. The fisherman then blurts out, “At least I didn’t offer the crab,” and is promptly beaten with the crab he also happened to be carrying. You’ll need to explore Capri’s natural caves by boat, but it’s well worth the trip. The caves are renowned for the interplay of sunlight that comes through the clear water to mesmerizing effect—particularly in the Blue Grotto. Perhaps Capri’s most iconic sight, the entire interior of the Blue Grotto is illuminated in hues of royal blue and emerald. These beautiful, terraced gardens rise above the sea and showcase the diversity of flora that thrives on Capri like dahlias, geraniums and brightly colored broom shrubs. The gardens offer a stunning 180-degree vista all around the island, including views of Mount Solaro, the Marina Piccola bay and the iconic coastal rock formations called faraglioni. Just three miles from mainland Italy, Capri is easily accessible by boat. The boat ride is also a great opportunity to view the picturesque Gulf of Naples, with its stunning backdrop of Mount Vesuvius, where the ruins of Pompeii and Herculaneum lie. Have you ever visited Capri? What was your favorite part?